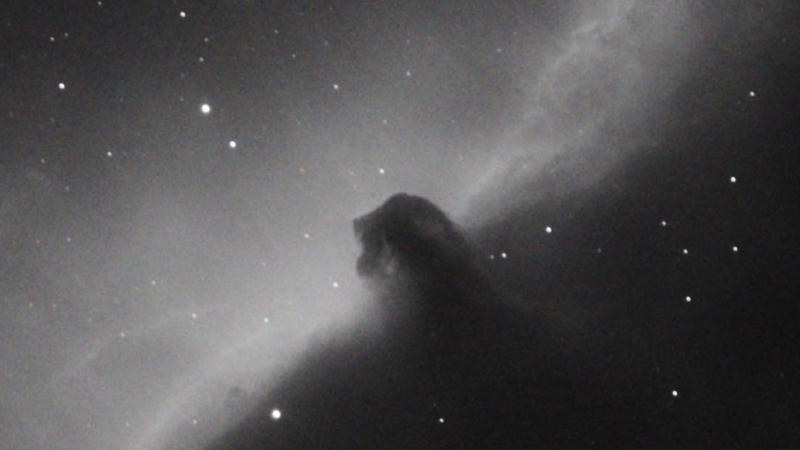 I have tried in the past to get a reasonable image of the horse head nebula, but have never had much success due to the light pollution and lack of experience. I wanted to take advantage of the relatively nice weather and started trying to image the Horse Head Nebula. Light pollution has become a problem in my area, and after several terrible results in the past using a colour camera, I decided to splurge and purchased a second hand QSI 583 mono camera with filters. Man I should have done this sooner. This is the result of first light for this camera. The image below is not fantastic and is only monochrome but I am very happy with the amount of detail I can see in this test exposure from a suburb that is heavily light polluted now. It was windy so the Active Optics unit was working overtime and there was a very bright moon very close to the target, so I used an Astrodon Ha filter. This is the result of 4×10 minute exposures through an ED80. There are many issues with the image for the fussy peeps, but it taken in difficult conditions with new gear and much cussing, as I was working out how to get it all working together. I can see more detail in the nebulous regions then I have ever managed to capture before. In the past the cloudy region around the horse head always looked plain and featureless. This time I have picked up more detail. I now want to capture much more data as 40 mins is no where near enough for this faint object, but of course its gonna be cloudy for the next week hehe. The result of 4×10 minute exposures, through an ED80 telescope, using a QSI mono camera with an HA filter. © 2019 BillD's corner of the net. All rights reserved.